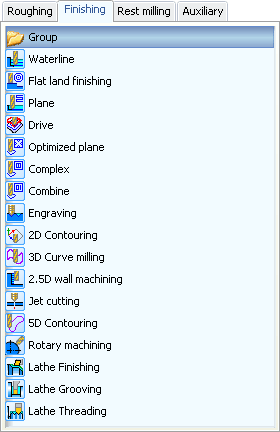 SprutCAM system represents the machining process as a sequence of operations. The sequence can contain any number of operations of various kind. 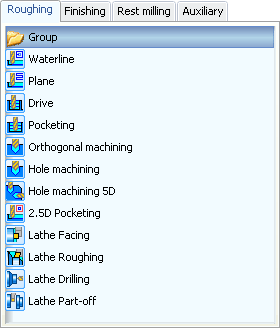 Each operation uses it's particular methods to form toolpath and accepts individual set of parameters. The list of available operations is defined by the system configuration. <Roughing operations> provide removal of the workpiece material, which lies outside of the part model and constrained by the fixtures. <Finishing operations> are generally used for the final machining of the part surface after roughing machining, or without roughing, if the final model does not differ much from the workpiece or if the workpiece is made of soft material. <Auxiliary operations>. This operations are created by the user individually for a machine depending on it's set up and machining technology. All new auxiliary operations are descendants of the abstract auxiliary operation. 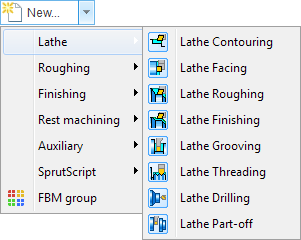 Should pay particular attention to the <Lathe contouring> operation. It, though classified as a finishing operation, allows the entire set of actions for processing parts - from rough material removal to grooving and threading. The universality of this operation is provided by the possibility to add to the job assignment of one operation several items that provide very different strategies of machining at once.